We were asked to make a fruit cake for a wedding taking place in Greece by a lovely bride called Kirsty. 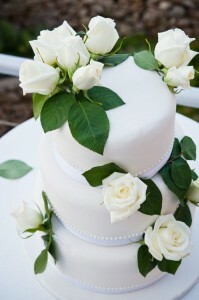 She wanted to decorate the wedding cake simply with fresh white roses on the day. We made a rum and brandy soaked three tier fruit cake which was to be driven from London to Zermatt and on to a Greek island. I wouldn’t ordinarily include such a simple cake on the blog but I just thought that it was really elegant with the fresh white roses sitting in posy picks and is a really cost effective way to decorate a wedding cake in these times of austerity!